The name Bhutan appears to derive from the ancient Indian term Bhotanta which means the end of the land of the Bhots. 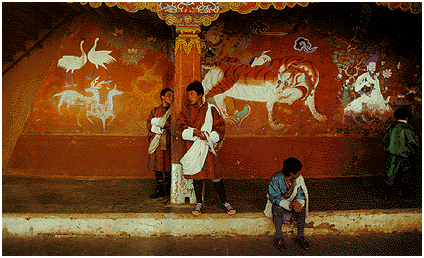 Bhot was the Sanskrit term for Tibetans, thus Bhutan could mean the end of the land of Tibet. It could also extend from the Sanskrit word Bhu’uttan or high land. No one seems to be sure. Ancient Tibetan writers called their fertile neighbour Lho Mon or Mon Yul, Paradise of the South or Land of the Monpas.The Bhutanese themselves refer to their country as Druk Yul or the Land of the Peaceful Dragon. 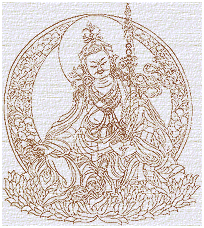 Druk meaning dragon and extending from the predominant Drukpa school of Tibetan Buddhism. Bhutan’s history parallels Buddhism’s following in the Himalayas and to properly understand Bhutan’s history one also needs to understand its religion. Mystery surrounds Bhutan’s distant past, as books and papers were lost in consecutive fires at the national printing works and at Punakha Dzong in 1828 and 1832. And then a massive earthquake in 1896 and a fire in Paro Dzong destroyed all but a few of the records that outlasted the first disasters. Despite these setbacks, enough reliable information has been recorded to piece together a history which sets apart this small kingdom from others in its vicinity. Bhutan was not unified under a central authority until the 17th Century,however, the religious presence in the country had been acting as a spiritual cohesion for many years. It was in 747AD that Padma Sambhava who is known as Guru Rimpoche made his legendary trip from Tibet across the mountains flying on a tigress’s back. He arrived in the Paro Valley at Takstang Lakhang,Tiger’s Nest. A monastery now perches precariously on the cliff’s face as a permanent memory to his name. Guru Rimpoche is the father of the Tantric strain of Mahayana Buddhism practised in Bhutan. His eight manifestations are worshipped in temples throughout the kingdom and wherever he visited in the kingdom is today a pilgrimage site highly revered by Bhutanese. Guru Rimpoche is not only recognised as the father of the Nyingmapa religious school but he is also considered to be the second Buddha. It was in the early middle ages that Buddhism blossomed in Bhutan. The Tibetan-based Kagyupa School was established at the beginning of the 12th Century and missionaries were sent south to spread its teachings. The Lhapa school, a Kagyupa sect, was set up in western Bhutan at the end of the 12th Century and the Drukpa School (another subdivision of Kagyupa) in the first half of the 13th Century. For the next 500 years, disputes between the two theories of Buddhist practice were common. In the end, the Drukpa school reigned supreme and was even accepted in the eastern and central areas where Nyingmapa monks had previously dominated. Many of Bhutan’s most celebrated ancestors descend from the Nyingmapa School, including the ancestors of the present-day royal family. Pema Lingpa, the best known Nyingmapa saint died in Bumthang, his home, in 1521. He was the reincarnation of Guru Rimpoche and Longchen Rabjampa the philosopher. In his lifetime he founded the monasteries at Petsheling, Kungzandra and Tamshing in the Bumthang valley. Many of Pema Lingpa’s descendants settled in the east where they strengthened the Nyingmapa’s hold on the area. Shabdrung Ngawang Namgyal, a Tibetan lama of the Drukpa School, designed the present system of intertwined religious and secular government. He was invited to Bhutan in 1616. At that time no central authority existed and regional conflict had persisted intermittently for centuries. In his quest to unify the country, he gained the support of many powerful families of his school and constructed Dzongs (fortress monasteries) in the main valleys of western Bhutan. Designed to scare aggressors, the Dzongs command a powerful presence over the valley in which they are still the centres of religious and civil authority. Shabdrung Ngawang fought and won a battle against the Tibetans in 1639 and assumed the title Shabdrung, meaning, at whose feet one submits’. In effect he became the first secular and religious leader in Bhutan. Later the Shabdrung unified the country and established himself as the country’s supreme leader and vested civil power in a high officer known as the Druk Desi. Religious affairs were charged to another leader, the Je Khenpo. The country was divided into regions and an intricate system of laws was codified. Bhutan’s first Shabdrung died in 1651. Within five years of his death the whole country had unified under the control of the central government. The last vestiges of Lhapa power disappeared and Drukpa became the focus of religious and civil obedience. During the next two centuries civil wars intermittently broke out and the regional penlops became increasingly more powerful. At the end of the 19th Century the Penlop of Tongsa (who controlled central and eastern Bhutan) overcame his greatest rival the Penlop of Paro (who controlled western Bhutan) and was soon afterwards recognised as the overall leader of Bhutan. The Penlop of Tongsa, Ugyen Wangchuck, was elected the first king of Bhutan in 1907 by an assembly of representatives of the monastic community, civil servants and the people. The monarchy has thrived ever since and the present King, His Majesty Jigme Singye Wangchuck, the first King’s great grandson, commands the overwhelming support of his people.